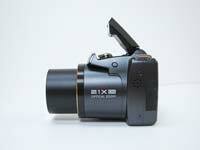 The BenQ GH700 is a bridge super-zoom compact camera with a 21x zoom lens and a 16-megapixel 1/2.3-type Sony BSI CMOS sensor. The GH700 has a 25-525mm equivalent zoom lens featuring aspherical and low-dispersion lens elements and nano-scale anti-reflection coating. The camera also offers 1080p/60fps Full HD videos, a selection of Program, Manual and Scene modes, a pop-up flash, 1cm super-macro mode, optical image stabilisation and a 3-inch, 460,000-dot rear screen. The BenQ GH700 has a recommended retail price of £219 / €200. BenQ as a camera brand hadn’t appeared on our radar for quite some time up until our recent review of the BenQ G1, a camera notable for being one of a very few pocket sized compacts to shoehorn in a tilting backscreen - indeed it claimed to be the world’s smallest to do so. With PBlog awarding the G1 a verdict of ‘better than expected’ - given that PC peripheral manufacturer BenQ’s previous photographic efforts had largely disappointed - will the GH700 super zoom, which at least outwardly appears a serious proposition, also meet with such ‘glowing’ praise? 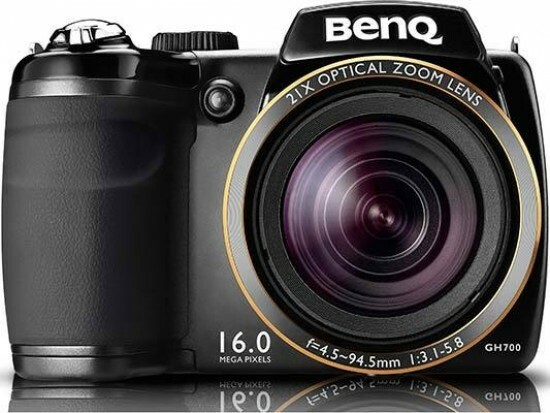 This is a DSLR-styled, 21x optical zoom bridge camera that won’t fit in anything except a roomy jacket pocket or bag. But it does offer a 16-megapixel effective resolution for a suggested £219. On the face of it, that sounds very reasonable. Build quality too feels similar to that of bridge-styled Canon PowerShots when the BenQ GH700 is gripped in the palm, the large rounded leather-effect, rubber-padded handgrip providing plenty of space to avoid knuckles scraping against the lens barrel. It would have been nice if this had been molded to the fingers more, but it’s adequate for what is after all a budget bridge. Adding a seal of sophistication, BenQ has encircled the GH700’s lens ring with gold detailing. The camera comes bundled with a clip-on plastic lens cap, shoulder strap and, more usually these days, a pouch-like carry case with Velcro fastening. The regulation issue 1/2.3-inch CMOS sensor here - sourced via Sony according to BenQ’s own blurb - is of the snigger inducing back-side illuminated (BSI) variety, which, slightly more seriously, suggests it should be a dab hand at delivering low light shots with less noise. This has also given rise to the inclusion of a Handheld Night Shot mode, which takes several shots in rapid succession to avoid blurring, and again in theory should be useful for snapping those night-time cityscapes, such as light playing off the water in Hong Kong harbour. Other features of note include continuous shooting speeds of up to 10 shots per second, 60fps 1920x1080 pixels Full HD video clips with stereo sound plus a 1cm super macro mode. Light sensitivity stretches from ISO160 to ISO1600, though there are ‘expanded’ ISO3200 and ISO6400 equivalent settings accessible - but only if the user first dials down the resolution setting to three megapixels, otherwise the options aren’t illuminated on the menu screen. The main point of conversation inevitably comes back to the optically image stabilised lens, which starts out at the 35mm equivalent of a wide angle 25mm and runs up to 525mm at the telephoto end. This ensures the GH700 is as adept at shoehorning group portraits and landscapes into frame as it is taking candid portraits from afar, or simply dragging faraway subjects nearer. Inevitably, and in spite of the on-board anti shake, we found that if shooting handheld at maximum zoom you might want to take two or three shots to end up with one sharp enough to be considered a keeper. What’s missing to aid shots from more creative angles is a tilting rear LCD screen, as well as the electronic viewfinder found on more premium bridge cameras. However, in fairness, the screen here is 3-inches in size and presented in standard 4:3 aspect ratio with a respectably clear 460k pixels resolution that we still found readable using outdoors in bright autumn sunshine. Overall body dimensions are 112.5x75.9x63.4mm, while it weighs 370g without batteries or SD card loaded. Both these share the same compartment, which means you have to cup a hand around the batteries to stop them falling out when removing a card, which can become irritating over time. In addition though, there is 85MB internal memory capacity to fall back on. As is de rigeur with cost-saving bridge cameras, power is supplied courtesy of four AA alkaline cells, claimed to last for 400 shots according to official TIPA testing, which is more than can usually be said of most lithium ion batteries found in compacts. There’s just the ability to shoot JPEG images however, with no Raw option provided here, which isn’t a massive surprise given the budget price tag. 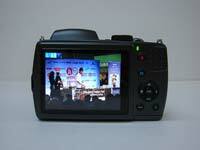 From the front then the BenQ GH700 looks the part as a jack-of-all-trades photographic option. In fact, apart from that gold lens ring it appears thoroughly conventional and generic in regard of what we expect a bridge model should look like. So we get the familiar hump of a pop-up flash positioned above the lens barrel. Here the flash has its own manual activation lever to one side. Give this a press and the spring-loaded flash instantly leaps to attention, like a scolded army recruit. 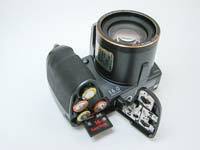 To the left of the physically imposing lens barrel is a small porthole housing the AF assist/self timer lamp. At the top of the handgrip sits a raised shutter release button surrounded by a lever for operating the zoom, this lever’s front lip jutting forward slightly for easier purchase. Unlike some super zooms which look slightly vulnerable, if not ridiculous, with their lens barrels fully extended at maximum telephoto setting, the BenQ GH700 keeps a more modest profile, lens tip standing just an inch and a half proud of its housing. OK, so 21x is more modest than the 30x or even 40x of some competitors and gives rise to the kind of focal range also achievable with a slimmer profile travel zoom, such as the Panasonic DMC-TZ30. For those who prefer a larger handgrip and more mini DSLR feel, the BenQ offers a cheaper alternative - time (and this review) will tell whether its image quality matches up. Looking down on this camera’s top plate, we aren’t hit with a daunting array of controls and options. The layout is quite clean, sparse even, and undoubtedly this makes the camera all the more approachable for anyone trading up from a smartphone or pocket snapshot. 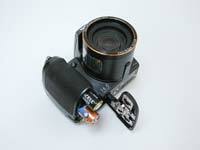 Behind the shutter release and zoom control is the on/off button, set flush with the top plate. Press this and the camera readies itself for action in two to three seconds, backplate LCD bursting into life and - provided you’ve removed the lens cap first - the barrel extending to maximum wide angle setting in anticipation of the first capture. Half squeeze the shutter release and focus and exposure is determined about a second later - not the fastest on the block, but adequate unless you’re dealing with moving subjects - for which of course there’s the 10fps burst mode. Take the shot however and barely two seconds later even in single shot mode the camera has written a highest 16MP image to memory and is ready for the next subject. The optical zoom is impressively quick to respond when shooting in stills mode, rocketing from maximum wideangle to top telephoto setting in all of three seconds, tops. However, this responsiveness makes it hard to be as precise as one might want when toggling back and forth to find your desired framing. Continuing the generic feel is the BenQ’s shooting mode dial. It’s the size of a five pence piece with ridged edging for easier purchase between forefinger and thumb. It clicks reasonably decisively into place at each of the eight setting ptions presented. Here these include program and manual modes (the second of which offers control over aperture and shutter speed) alongside intelligent auto - here named ‘intelligent scene’. We also get a collection of scene modes and separate options on the dial for both night portraits and handheld night scenes. The last options here are for the self-explanatory continuous shooting and HDR (High Dynamic Range) modes, the latter automatically taking two shots at different exposures in rapid succession and blending them whilst at the same time boosting colour saturation. Use of HDR works best when you have a bright sky and dark foreground in a shot, and though you might not want to keep every execution the camera makes in this mode - some are more ‘photo realistic’ than others - it’s a useful fully automatic tool to have on board, particularly when shooting conditions are otherwise rather dull, or lighting particularly tricky. Other than the above, two raised lugs are provided left and right of the top plate for threading through the provided shoulder strap, which in this instance makes for more comfortable transportation. Moving our attention to the back plate, and, top right, there are three strips of four small raised plastic nodules to provide a point of purchase for the thumb. However, since this roughened strip slopes slightly inward and a one touch record button for video capture is located immediately to its left, it is possible to inadvertently find yourself starting to record on the BenQ GH700 when merely in the act of handling the camera or steadying our grip. So in other words the record button could do with another little piece of raised plastic around it. Something for the next generation model perhaps. It’s also worth noting that when in video mode it’s best to first choose your intended subject and focus in on that before altering framing mid recording - as the focus doesn’t adjust in real time to keep up with your subject, and thus you otherwise just end up zooming in on a blur. At least the zoom can actually be used during video recording though, plus stereo sound is provided courtesy of two microphones ranged either side of the lens barrel, secreted beneath the overhang of the pop up flash. It’s not terrible; it just could be better. The attendant buttons on the backplate are what we’d expect to find at the rear of just about any compact camera. There’s a dedicated playback button just before the record button, and a four-way control pad with central ‘OK’ button for affecting any changes as you tab through the provided menu options, which here feel like they’ve been boiled down to just the essentials; not always a bad thing if ease of use and navigation is high on your list of concerns when making a purchase. But one begins to suspect that the BenQ GH700 is probably best sold on the ticket of being a bridge camera for beginners or upgraders, not photo enthusiasts. The other settings around this control dial/pad are also immediately obvious to just about anyone who has handled a digital camera before. Topper-most at 12 0’clock is a setting for adjusting the self-timer (10 seconds or two seconds), while at three o’clock is a setting for the flash options, which here are non-existent unless the user has first manually raised the flash. Once this has happened we get a choice of forced flash, slow sync, automatic flash or forced flash with red eye reduction. The flash can be slow to warm up and get going - particularly the first time it is deployed, but then it must be remembered that this is a budget bridge camera after all. A six o’clock on the control dial is a setting for adjusting the display, which - in surprising but welcome fashion - allows the user to call up a live histogram as well as the familiar nine-zone grid via which to practice the rule of thirds. You can also get rid of all the operational icons from the screen, excepting the shooting mode, number of shots remaining and whether the flash is active at that particular juncture or not. The last option on the control dial/pad is for calling up the macro/close up mode, which as we noted earlier allows the photographer to get as close as 1cm from their subject at the camera’s widest setting. The final two options at the BenQ GH700’s back, bottom right of screen, are for the self explanatory ‘menu’ and a dedicated delete button, which always comes in very useful for dispatching duff shots in a second or two. The menu option is here sub divided into three sections: one for stills capture, a second for video and a third being your standard set up mode menu indicated by familiar spanner icon. It’s via ‘menu’ that we can of course set image size and quality, running from 4608x3456 pixels right down to 640x480 pixels. Exposure compensation is also here, with a modest choice of +/- 2EV via a vertical slider displayed on screen. This is also the location of the means of tweaking white balance, ISO and metering settings - the latter option offering up the regular multi, centre-weighted or spot modes. The AF area can further be adjusted, with a choice of a wide area focus or weighting it towards centre of frame, with face priority being the third choice. 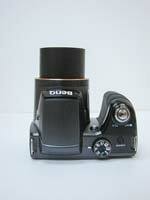 Digital zoom, AF lamp and image stabilizer settings are also to be found here. Generally the menu is well presented if simplistic in its narrow range of choices, with large white on black type, so nobody should get lost navigating through it. Secondly, the movie ‘menu’ options govern both resolution and frame rate settings, with the chance to dial down from the top 1920x1080 pixels at 60fps to a QVGA 320x240 pixels setting at 240fps for that slow motion effect, the quality of which resembles a badly beaten VHS tape - which actually isn’t that bad a ‘retro’ effect in this crystal clear digitally enhanced age. 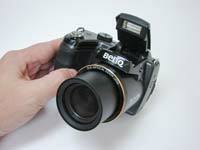 BenQ also offers a wind cut function with this model, which is always welcome when filming outdoors. Finally, the set up menu mode provides access to a means of adjusting LCD brightness (if required), formatting the memory in use, adjusting the start up sounds, resetting all selected functions and so on. All pretty standard stuff in other words. While the right hand flank of the camera, as viewed from the back, is devoid of any features whatsoever, the left side features a rubber port protecting both a USB output and an adjacent HDMI port, though both are unmarked. The base of the camera features a screw thread for a tripod, located slightly off centre, and, in the base of the handgrip, the combined AA battery and SD card compartment. Again, simple, generic stuff. From all of the above the BenQ GH700 would seem to be very much a standard issue bridge camera aimed more at the entry level end of the market - best suited to someone want a broad focal range and a jack of all trades device without shelling out a king’s ransom - rather than existing as something to tempt the photo enthusiast. But, wait, do its images tell another story? Click forward to our next section to find out. aperture. To the best of my recollection the brand has never been a global best or first at anything before, so initial impressions at least are positive.